One of the quilting goals I set for myself was to sew every day. To make this goal actually happen, I had to make sure it was realistic. In order to do that, I set a minimum time limit of just 10 minutes a day of sewing. I also broadened my definition of “sewing” to include designing quilts, reading quilt magazines and watching online quilting classes. I’ve signed up for several Craftsy quilting classes. 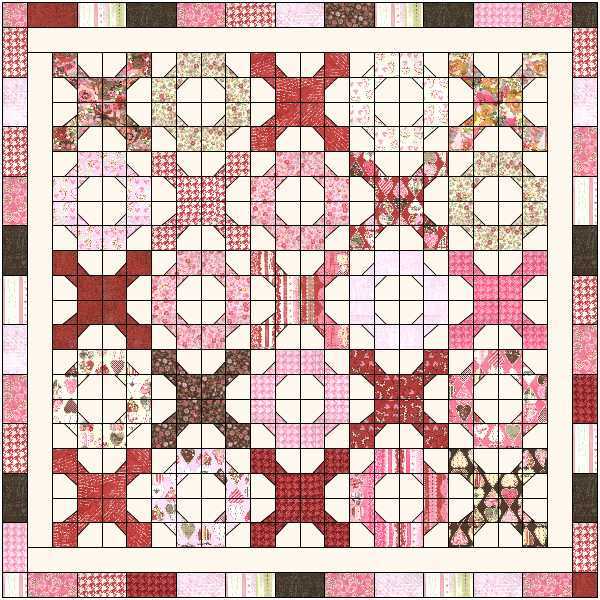 I just finished watching Elizabeth Hartman’s free “Creative Quilt Backs Class” and am currently viewing Cindy Needham’s “Design It, Quilt It” class. They are both excellent! I pulled these lovely fabrics to participate in the Skillbuilder Block of the Month over at PileOFabrics.com. I decided to go with all Kona Solids for this quilt. I haven’t decided on my background fabric yet. I’ll probably choose a shade of Grey. I used the color wheel when choosing colors and went with an “accented analagous” color scheme. That means I chose red, orange and yellow which are next to each other on the color wheel, then threw in a bit of complementary teal just for fun. I can’t wait to get started! 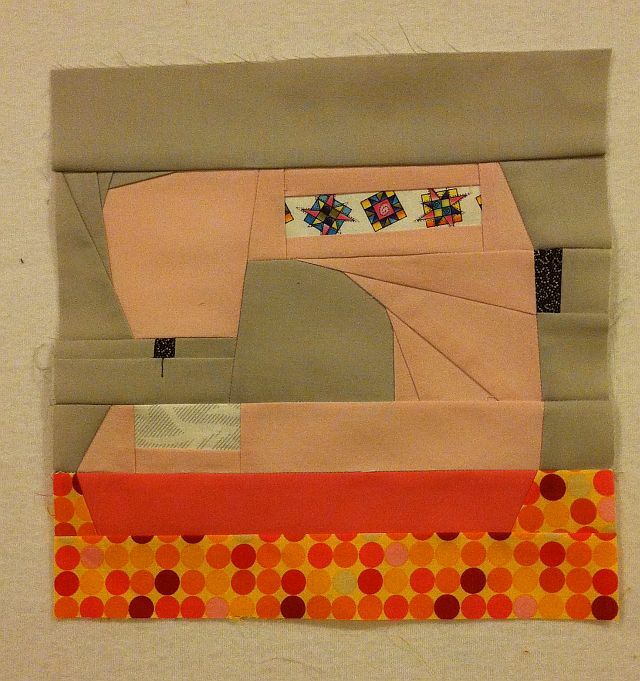 Today, I paper-pieced this sewing themed block as part of Quiet Play’s And Sew On year-long block-of-the-month series. 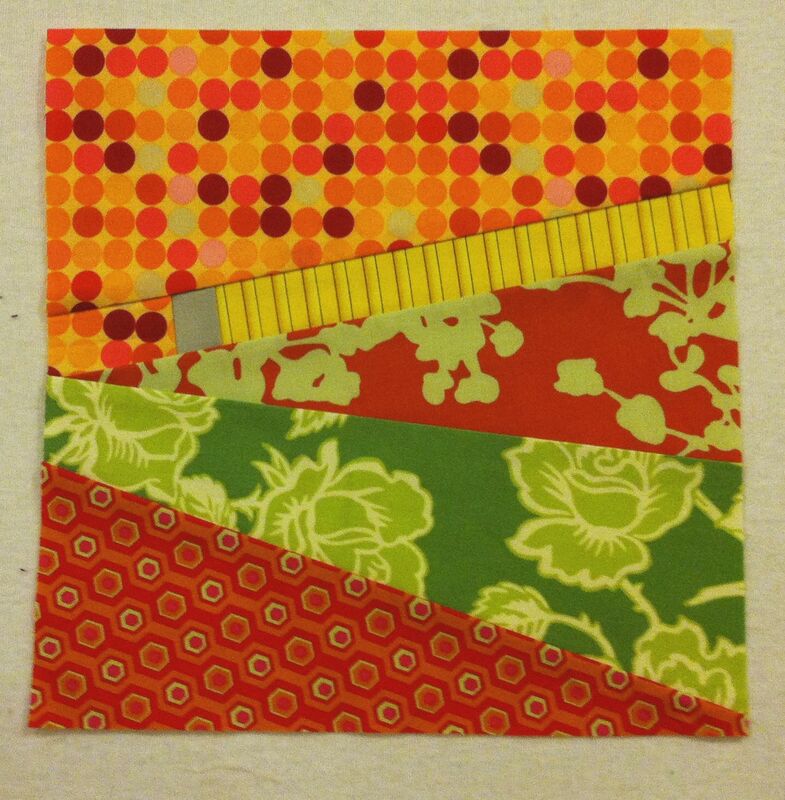 January’s block is called “Measure Twice” and is available as a free download this month. I also made this block designed by Amy Friend of During Quiet Time. I love the sewing theme so I may have to incorporate it into the same quilt! Next, I designed this quilt in EQ7 which will be the basis for my next quilt-along as soon as the current one finishes. I found out how to download Moda’s fabric swatches directly into the design program so I can design quilts using the actual fabrics from the quilt. Very cool! 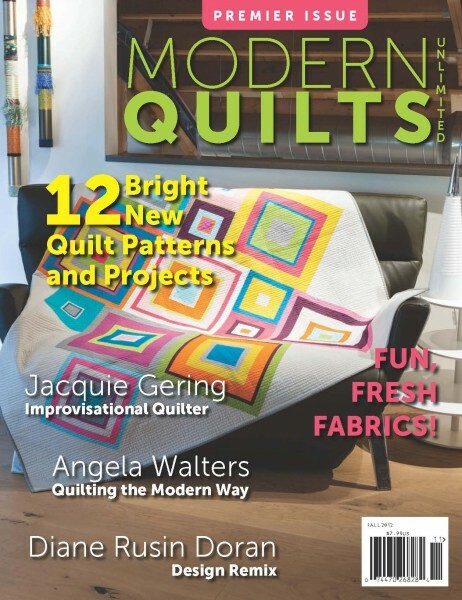 When I don’t feel up to sewing, or when I’m traveling, and bringing along sewing supplies is impractical, I have a stack of quilting magazines that I am thoroughly enjoying reading. 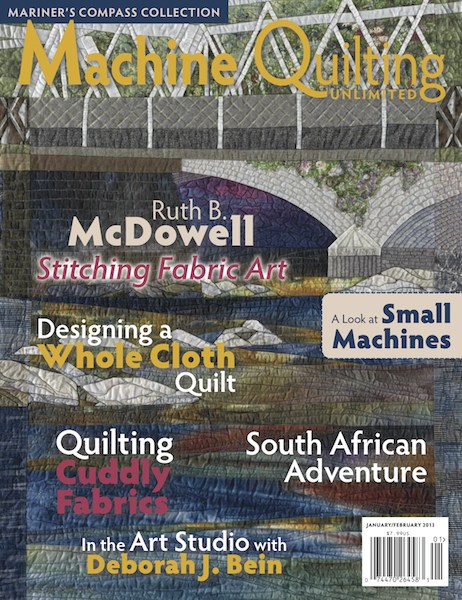 My favorite magazines are Machine Quilting Unlimited, along with their brand new sister publication Modern Quilts Unlimited. 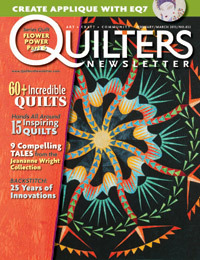 I’ve also been a long-time subscriber of Quilter’s Newsletter, the best source of news for what’s hot and happening in the quilting world. I think that’s a great start for January! How about you? 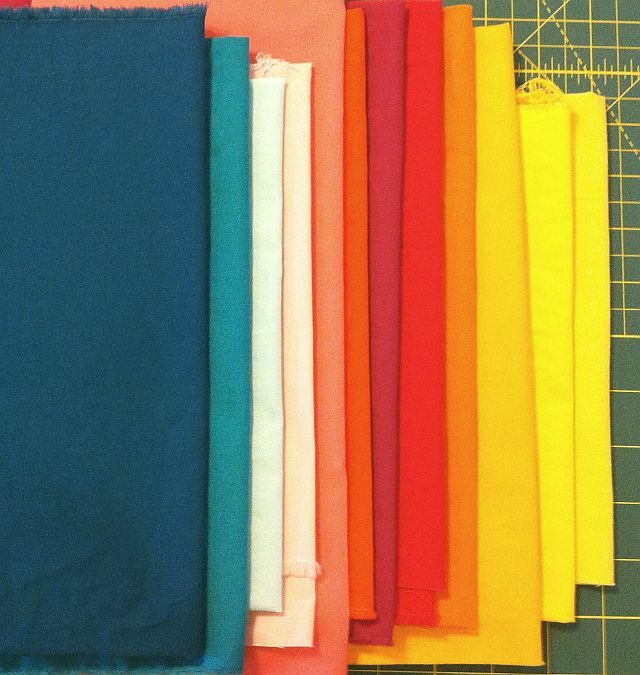 How are you coming along with your quilting goals? I like your definitions of crafting – i’ve added “checking pinterest”, so I can claim to have done some sewing every day too. I like your measure twice block and think the striped fabric is a great idea! I love your new Hugs and Kisses design. You keep tempting me with your quilt alongs. Hopefully, I will be able to join the next one. I made a very similar resolution – “craft” everyday. I find it helps to center me and makes me spend some time doing something I really enjoy. I just love the hugs and kisses quilt, and I am currently cutting my fabric for Sea of Squares! I’m not using charms, so i’m doing a bit more cutting, but I’m so excited about the quilt! Thank you so much for your generous work on the QALs for people like me! Thanks Linda. I am glad you are enjoying it. I love to design quilts – it gives me a purpose and a reason to make them! Ooh your Measure Twice block looks fab! I love the striped fabric for the tape measure! Love the new quilt design. I think one of my favourite things about EQ7 is being able to import the actual fabric images so I can see how they’d really look in a quilt! I love your XOXO quilt, so cute. Also love your color choices for Skill Builder! Thanks Alyssa – I can’t believe how much I keep gravitating to the solids. Now I can’t wait to make your blocks! LOVE your fabrics for the And Sew On… BOM. I’m so glad you signed up for that BOM because when I saw you block on Quiet Play’s blog and it took me here I was sooooo happy to see your DIY QA’s! Love them, your instructions, and the plan for the next one. I probably won’t be able to get in on the current one, (we’ll see though). But count me in on the next one. I can’t believe I haven’t run in to your blog before now. LOVE it already! I’m trying to sew more and blog less… but you know how that goes. Thanks! You are a very fast sewer. I have to assemble the three parts to make the block. You sew in 2.5 hours and I take 2.5 days but I don’t sew every day. I want to do the next quilt too. I like your quilts and designs because they are basic elements. I will be using a Jelly roll when I make this current one again. Thanks so much.Christa. Thanks! I do best when I set deadlines for myself and I like easy quilts the best! I love that hugs and kisses idea!